So good to see everyone at the Spring Meeting. It has been such a long winter, that it was nice to talk about boating and the summer months to come. Thanks to all the Dollar-per-Member clubs that responded to our request so promptly. A second mailing will be coming soon to those clubs that are just “waking up” for the boating season. Another exciting celebration this year will be the start of our Centennial Celebration. The Yachtsmen’s Fund was incorporated in 1919. We will launch special donor opportunities this fall. 2018 promises to be another exciting year as I-LYA Clubs, with the support of the Yachtsmen’s Fund, host three US Sailing National Championships: Junior Women’s Doublehanded Championship for the Ida Lewis Trophy at Mentor Harbor Yachting Club in July, Chubb US Sailing Junior Championships for the Sears Cup and Bemis & Smythe Trophies at North Cape Yacht Club in August, and the US Team Racing Championship for the Hinman Trophy at the Foundry in Cleveland in September. Thank you again to our annual members, life members, and all the clubs that participate in our Dollar-per-Member program. Your support makes our work possible. 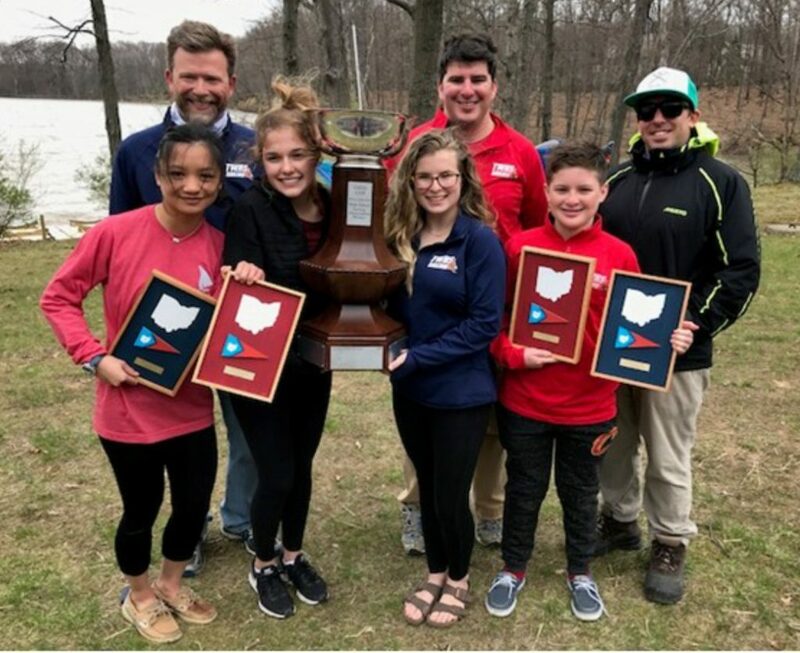 Thirteen teams representing 10 Ohio schools competed in windy conditions on April 28, 2018 at Hoover Sailing Club to crown this year’s Ohio High School Sailing Champs. Finishing 1, 2, 3 were Thomas Worthington High School, Westerville South High School, and Westerville North High School. Full scores are available online at https://scores.hssailing.org/s-18/ohio-state/full-scores/. Look closely and you will see lots of familiar I-LYA Junior Sailors who will hit the ground running when the Traveler Series kicks off in June.